My boys are called to the apple bins at the grocery store these days like a siren song. Framing every bin are rows of gooey caramel apples, studded with nuts, candies and chocolate. Seriously, I can’t blame them for being drawn in, they are irresistible. But, then you bite into them and they are always just a touch disappointing. 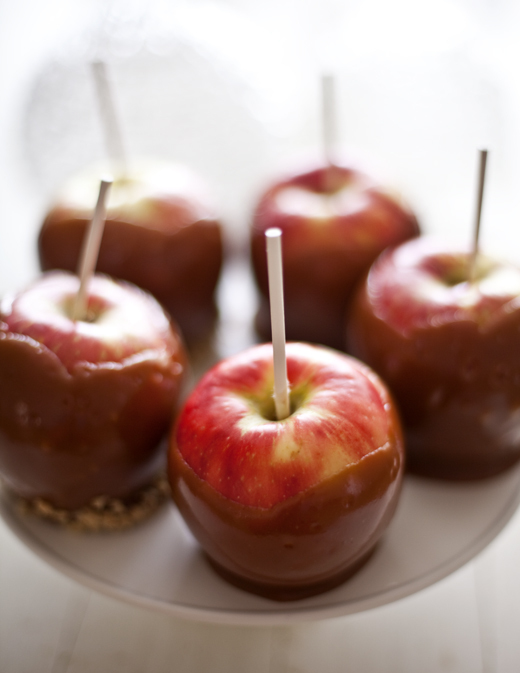 The apples are usually soft and the caramel is cloyingly sweet and tastes like it was from the previous generation. I convinced my boys to walk by without taking one, but only after promising to make them some at home. We picked fresh, crisp, juicy apples (Honeycrisp, Sweet Tango or a variety that is a bit tart). 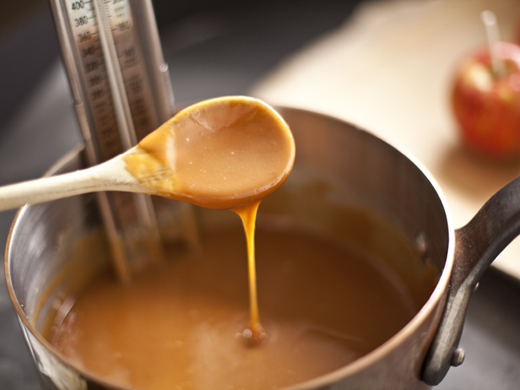 The caramel is easy to make and is rich, creamy, gooey and not over-the-top sweet. I like them with salted peanuts pressed into the caramel, but the boys like the apples dipped in caramel with no other interruptions. Prepare a cookie sheet with a lightly buttered sheet of parchment, set aside. 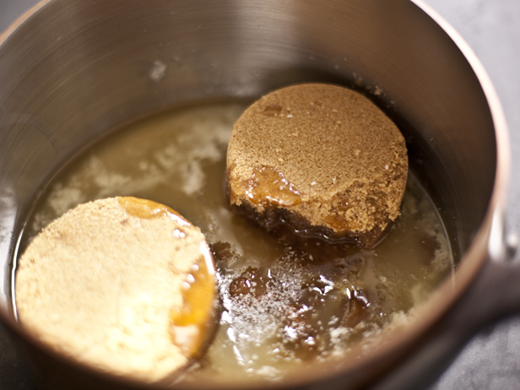 In a 2-quart saucepan, melt the butter, then add the brown sugar, corn syrup, honey and salt. Cook over medium heat, stirring, until the mixture starts to boil. This can take about 10 minutes. 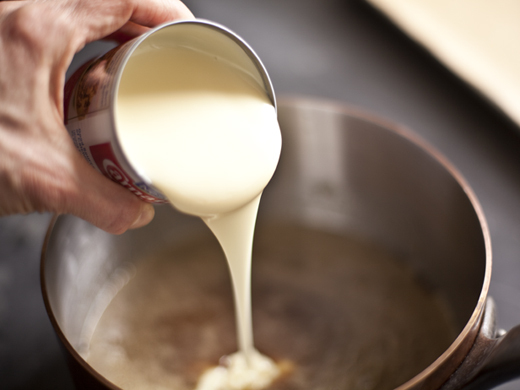 Add the sweetened condensed milk and continue to cook, stirring occasionally, until the mixture reaches 238°F on a Candy Thermometer . and allow it to cool to about 200°F. It will begin to thicken as it cools. It should be thin enough to coat the apple, but thick enough to cling to the fruit. 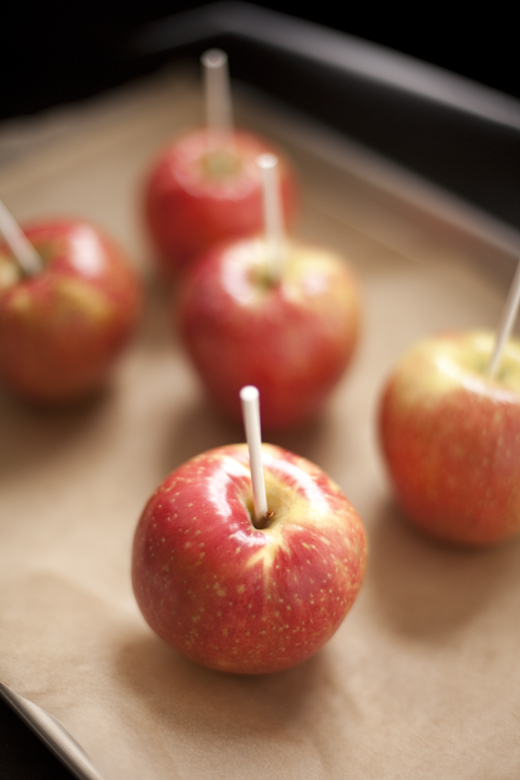 While the caramel is cooling, stick the Lollipop or popsicle sticks into the apple. 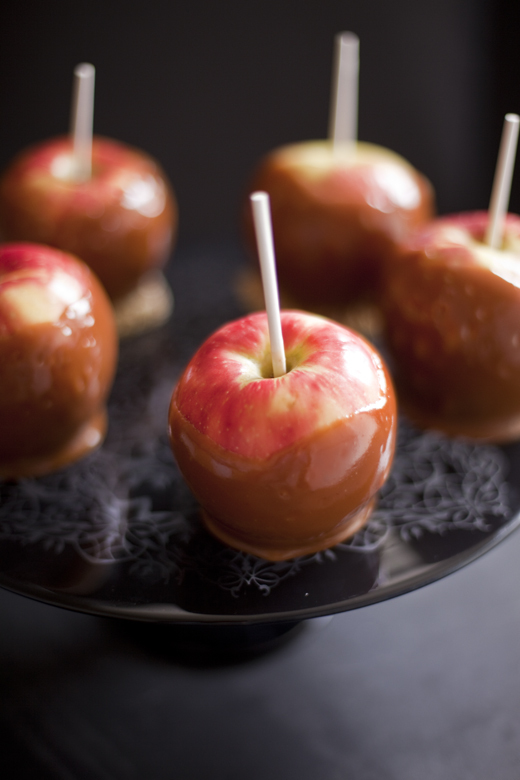 Make sure they are deep enough that they won’t fall out while you are dipping the apples in the caramel. 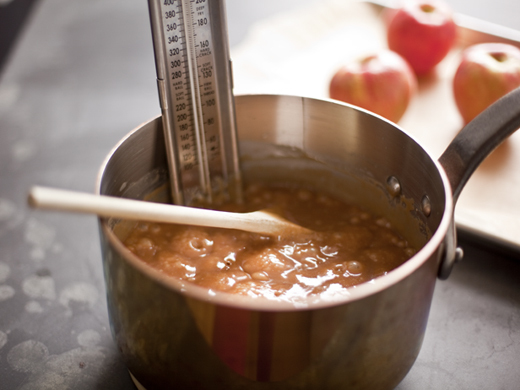 Dip the apples into the caramel. I like how they look when some of the apple is still showing, but you can completely cover them if you prefer. 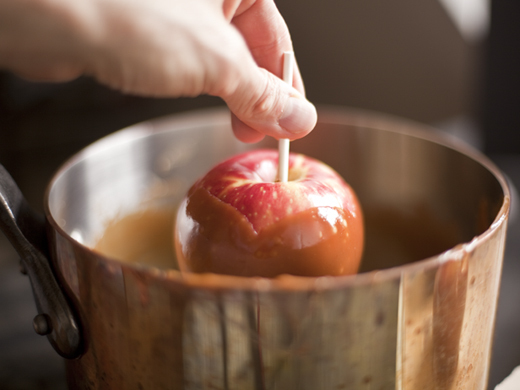 Hold the apple over the pot of caramel and allow some of the excess to drip off before placing them on the sheet of buttered parchment. If you want, dip the bottom in the crushed peanuts. Keep the apples in a cool, dry place and they will last for a few days, loosely covered with plastic. You know, I was at the farmer’s market yesterday, buying every kind of apple imaginable, and I bought a whole pile of small beautiful ones especially to make caramel apples. I put them in my fridge and thought to myself that Zoe surely has either done caramel apples or will soon. And there they are, ready, and here you are, posting. Perfect. I just put lollipop sticks in my Amazon shopping cart. these look so fun! and i love that you didn’t fill them all the way to the top. Love can be found inside a caramel apple, at least the love of my 8-year-old can be. Caramel apples are always fun to make. I use green apples most of the time and use some red color to get the Halloween look. So very perfect for fall. 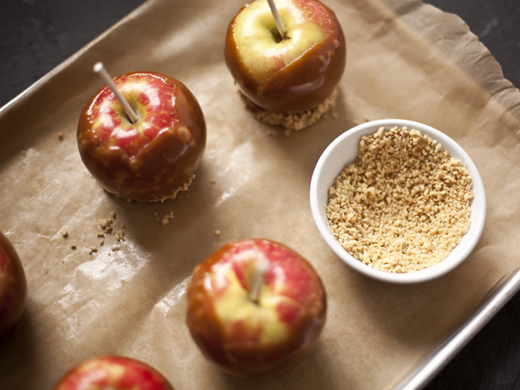 I knew I could count on you for a caramel apple recipe made with real caramel rather than something from a package. Thank you so much!!! I haven’t had a caramel apple in easily over a decade. Each year I swear I’m going to make some and I never do. Wish I could reach through the screen and grab one! What a brilliant recipe, Jenifer! Very fun to make and beautiful for showing. I’ll try this with green apple. the combination of green and brown is fantastic. I must have this tonight! My mouth is watering so much.. Give it tooo mee!! yum!